Ok, here's a new quick tutorial for everyone who has been having to deal with Facebook blocking your entrance into someone's account due to logging in from a different location. Ever since I had been problems constantly having to deal with Facebook leaving me out off people's accounts I began to think that I should write over my experiences to help others. I will go over specific techniques and ideas to eventually grant you entrance to their accounts without having to deal with that Facebook problem having logging in from different location. 1st. Before you even begin reading this, you must already have their passwords or e-mails. If not, I will tell you a few ideas of how to acquire them. If you only want to log in without changing passwords, I would suggest that you steal their passwords through Phishing, keylogging, or RATing. 2nd. 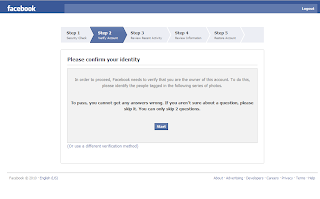 Bypassing Facebook security can be done through black hat methods, however I will not go over those methods, instead I will be touching the social engineering methods which are more effective and you can get faster results. 3rd. You will need to use your brain to think and have patience. If you don't have either a brain to think or the patience to wait, please don't continue reading this tutorial because you will not get any success. Ok, let's move on to the actual information. -This method is a cheap short method, but you never know if it might work or not. #1. If a person uses a particular computer to log in to their accounts on a regular basis, THAT computer alone should be your focus. You should infect that computer with a keylogger and have it linked together with a FTP to send you the logs or linked to send you e-mails. #2. Another method is to use your OWN computer to acquire the password by infecting yourself with a keylogger and let the slave use your computer. Gain their trust to the point of where they can log in to different websites. You can say for instance "My account is not working, I think Facebook banned me. Can you test your account to see if yours is working?" And of course, they will log in and you will gain the information. After they successfully log in, you can login to your account and say "Oh, there we go! It worked"
Now, you will attempt to log in in the future and the problem of Logging in from another location will dissapear. #3. Let's say that they aren't stupid enough to use your computer to log in, you might think, what then? Well, here's my next suggestion to you. Considering that you will already have the password through the methods I mentioned earlier, but you will have the problem of Logging in from another location. Most people will use any computer to log in to Social Networks or E-mails to check on updates. Considering that the IP you log in at that particular is the same within their network, the problem of Logging in from another location will not come up. #4. So, you don't have the choice of either offering your computer as a trap or the chance to "stalk" your slave. You wonder, what do I do then? Well, this is where it gets more tricky considering that Facebook finally came up with an ingenious method to avoid intruders of taking over accounts easily. 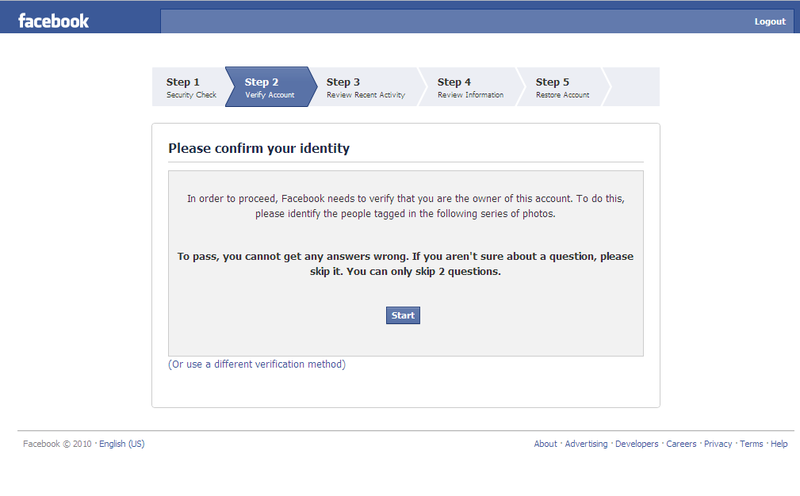 Here's what Facebook did, in case if you don't already know. Facebook implemented a feature where you must visually recognize the friends on that account. 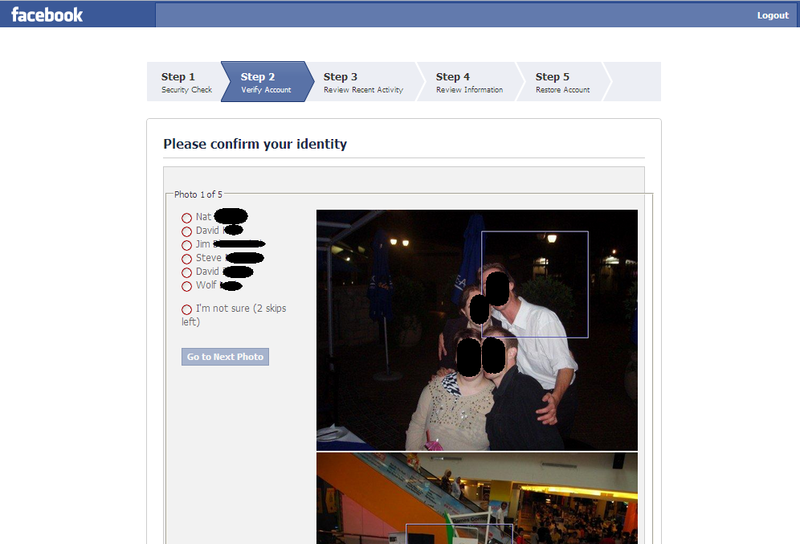 They will show you pictures of random people within that account and ask you to select the name of that person. If you don't recognize any of those people, you're screwed. When will this happen? That will only happen when you attempt to change their passwords, so Facebook makes sure that you do in fact own that account. I personally wouldn't attempt to change the passwords, but if you do try, here's what I would recommend to you. -If you know the person in person, notice who he/she is friends with to try to recognize the faces and physically ask the other persons their names. To search their names, e-mails, phone numbers to see whether if you can find them on other Social networks. You can search the person's name manually by going to Myspace, Facebook, etc...To see who they have added as friends. Your next step will be to add a friend of the slave or the slave directly. Adding the slave directly would probably be the best plan because you would have access directly to all the victims' friends and their pictures. 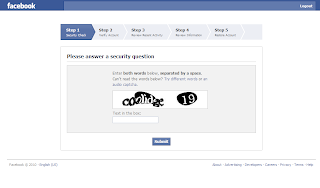 Now, all you have to do is match the pictures that Facebook asks you when you attempt to change their passwords by going to the victims friends and match them. If you don't want to change their passwords, you can mask the slave's IP using other methods in which I will not go over. To find out their IP, you will need a RAT to manually whois them or any other method other there to find their IP. A quick method I will suggest to you is to send the slave an e-mail if they have a hotmail account. When they reply you can right click on the e-mail and view source. You will see an IP from sender and use that to mask. Mask their IP and facebook will not give you the problem of Logging in from another location. If you follow the suggestions I have given you, you will surely gain entrance to their accounts and Facebook won't be able to do crap.